With so many helmet options available to the motocross and off-road riding and racing communities, SHOEI takes great pride in the fact that more top riders prefer the groundbreaking VFX-W over all others. The absolute pinnacle of off-road helmets, the VFX-W is the result of countless hours of conceptualization, R&D, and testing with the most hard-nosed critics of all, our professional racing team. With top pros like Kevin Windham, Josh Grant, Josh Strang, and Destry Abbott leading the charge, the VFX-W is drenched in state-of-the-art features, and absolutely no stone was left unturned during its development. If you�re looking for a new lid to hit the track or trail, look no further. 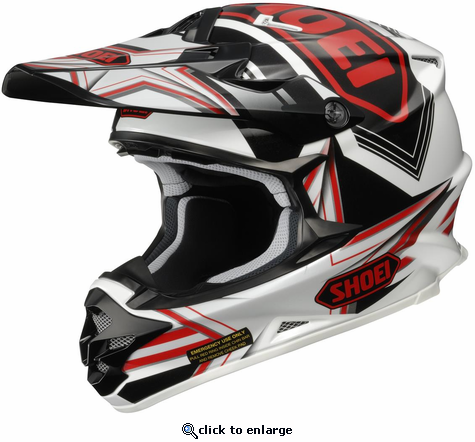 Shoei's proprietary AIM+ technology. This process combines fiberglass with organic fibers that are so strong that they can only be cut with a laser. The end result is a stronger, lighter shell that will absorb and distribute the force of an impact safely and efficiently. 5-Year Warranty From Purchase Date. 7-Year Warranty From Helmet Manufacture Date. Whichever comes first. 1. Fiber-Reinforced Matrix: An outer shell that is made primarily of fiberglass (FRP) is given its shape by a heat-setting plastic resin. The SHOEI helmet shell owes its ideal function to the integration of organic fibers, as well as a three-dimensional shaping process in a layered structure. The result is an outer shell with high strength, but very low weight as compared to shells that are produced in a conventional way. shell that is made only of glass fibers, the AIM outer shell is both lighter and more elastic, yet has the same strength and is more resistant to penetration due to the additional use of special fibers. 3. The Synthetic Resin: A specially modified, unsaturated polyester resin (a so-called heat-setting plastic) is used for the AIM outer shell. This resin acquires the desired strength and elasticity during the heat hardening process. This synthetic resin is also extremely resistant to corrosion. With these constituent parts, we produce outer shells that convincingly produce ideal dampening of impacts, good elasticity, light weight, and enormously high strength and resistance to penetration. In addition to its enormous weight advantages, the AIM outer shell from SHOEI offers the best possible impact protection, as well. Through the interaction of the strength and the elasticity of the various materials, the AIM shell has been designed in such a way that the effect of an impact is absorbed and distributed over the largest possible area so that it may be more easily absorbed by the EPS liner. Thus, the shell and the EPS liner may show damage from deformation after an impact, but the head of the rider is given the maximum amount of protection as a result. Heavy, hard helmet shells do not have this ability and direct the energy from an impact without any reduction into the inside of the helmet. In many cases, the shell may be undamaged, but head injuries are much more likely. The stress applied to the neck muscles when riding a motorcycle comes not only from the weight of the helmet itself, but also from wind resistance. For that reason, improving the aerodynamics is an important factor in preventing the onset of fatigue. The SHOEI product development team regularly performs tests in its own wind tunnel to improve shell design and optimize aerodynamic properties. Back in the early 1980s, SHOEI developed a ventilation system that passed air through holes in the helmet shell without affecting stability. The idea that good ventilation is crucial for the safety of a helmet caused a fundamental change in the design of motorcycle helmets. Once again, this makes it clear how important the safety concepts and the spirit of innovation are at SHOEI. The investment in a wind tunnel of our own allows us to carry out intensive studies in the development of effective, high-performance ventilation systems. SHOEI has developed a dual EPS liner whose air system allows an optimum exchange of warm, humid air with incoming cold, fresh air. The shield protects the rider against wind, dirt and insects. In addition to full-face helmets, many ¾ shell helmets and half helmets are equipped with shields. All SHOEI shields are made of polycarbonate, and the majority of our shields are produced by an injection molding process, which guarantees clear and distortion-free vision. Furthermore, the shield protects against small stones and absorbs 99% of the UV radiation, and its coating prevents scratches and lets water bead off more easily. Except for the Hornet-DS model, all of our shields are equipped with SHOEI’s own Q.R.B.P. system that allows the shield to be changed quickly and easily without needing any tools. The smooth surface of a SHOEI shield base plate system eliminates the irritating shield cover that some of our competitors utilize, which helps prevent unnecessary wind noise. Noise imposes unnecessary stress on the rider and can disturb his or her concentration. There are two ways to reduce noise in the helmet. Wind noise can be reduced by optimizing the aerodynamics. Additionally, the acoustic damping properties of the helmet can be optimized through careful design of the helmet shell and the padding. The decisive factor for a comfortable and quiet helmet is the balanced utilization of these two approaches. Utilizing a thicker helmet shell, eliminating ventilation, or using padding that is too tight may reduce the amount of noise experienced, but this is achieved at the expense of safety and comfort. This is not an option for SHOEI. All SHOEI helmets are developed with safety, comfort, and passion in mind. Information gained from all over the world goes into the development of each and every model. With safety, comfort, and passion in mind, product development takes customer wishes, the demands of the market, and new trends into consideration. Although safety and functionality always play the dominant role, the design aspect is never neglected. This special combination of perfect functionality and unique design is testimony to the passion that motorcycle riders all over the world experience. More than 20 years ago, SHOEI was the first maker to recognize the importance of aerodynamics in designing a helmet. During this time, SHOEI invested in a wind tunnel of its own that is an indispensable constituent part of product development. In addition, tests to explore the effects of wind resistance and the various forces applied are constantly measured to determine the performance of the ventilation, as well as how much noise is being produced. Intensive test rides are performed to verify the results of the wind tunnel testing on several aspects of the helmet. For example, the various forms of air flow created by different types of motorcycles, as well as the comfort experienced during long rides, are investigated and taken into consideration when developing a helmet design. Nowhere are the requirements placed on a helmet more extreme than in professional racing. The development of SHOEI sports helmets is decisively supported by our factory riders in MotoGP, Supercross, and other international classes. Among other things, the ventilation system and the quick-change visor system were developed first for racing. 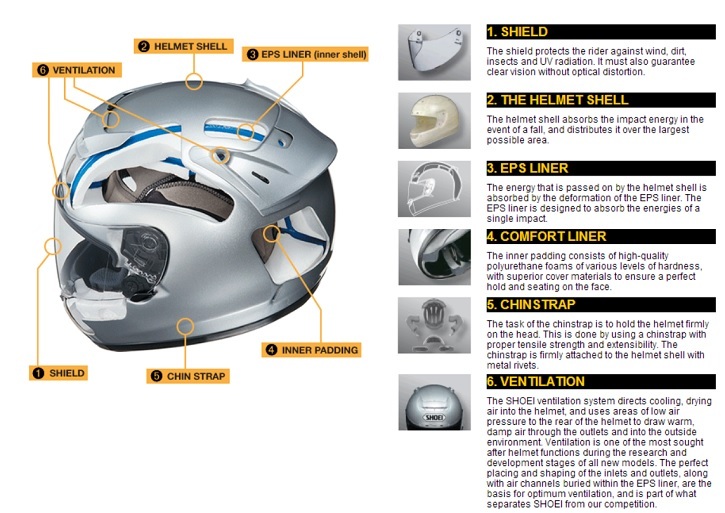 Today, every rider with a SHOEI helmet can benefit from these technologies.